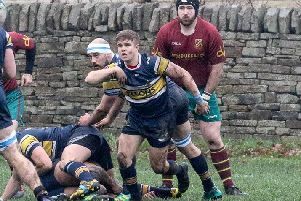 Old Crossleyans supporters were left biting their nails as a Hullensians side desperate for points to ease their relegation worries mounted a late push for victory before going down 28-22 at Broomfield yesterday. A well above average crowd, bathed in early spring sunshine, witnessed a game that at one point had looked a little one-sided. However, the visitors not only gained a losing bonus point but almost a win in the final minute. Tony Oxley returned at lock and Joe Stott’s return from injury was well timed in the absence of Chris Vine for the home side. Several phases of early possession from Hullensians never took them past the half way line due to strong defence from the home side. A defence splitting charge from Mark Boothroyd, carried on by Billy Hammond, resulted in Stott cleverly back flipping a pass to Boothroyd, who finished the move he had created, Callum Dunne added the extras and Crocs were up and running. Further pressure following a good 40-yard kick to the corner from Joe Gallagher came to nothing when the Crocs throw to the line was deemed not straight. Referee La Toya Mason, a former England women’s international with more than 70 caps to her name, was firmly in charge and awarded the visitors a penalty when one of the home players offended at the breakdown, Stand off Chris Harding gave Crocs notice of his kicking prowess when he nonchalantly popped the ball over from 35 yards and then followed it up with another for a similar offence. The visitors, without really looking dangerous, were only one point in arrears. Hullensians scrum half Callum Arro started to ask the hosts some searching questions with several sniping runs around the ruck area and only excellent cover defence kept him from linking up with teammates well positioned to take advantage. Billy Hammond, who was threatening all afternoon, made a strong run out of defence and after a bout of what looked like ping pong the ball was received by winger Josh Hunt, who added to his list of tries in recent weeks by strolling effortlessly under the posts. Dunne converted and Crocs looked well set. However, two penalties were missed by the home side and another penalty at the breakdown against Crocs, quickly followed by one for a high tackle, allowed Harding to add six more points and at half time there was only two points between the sides. Play resumed with the home team in the ascendency and the Hullensians pack were driven off the ball on their own scrum with the front row of Roland Marki, Jack Pilcher and Sam Ives clearly dominant in this area. The resulting penalty was driven on and Pilcher barrelled his way over the line. Stott then broke away and found Billy Hammond on his shoulder. 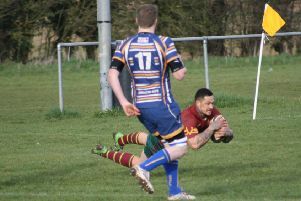 The bonus point try was gained as Hammond shrugged off several tackles to notch a well-deserved try. The visitors weren’t finished though and once again Arro caused panic with a darting 40-yard break. Only good covering from the tireless Martin Hamer, Ryan Hammond, George Hammond and Raman Sembi stopped the threat. Arro tried again, but his pass was intercepted by James Cooper, who fed Jack Hammond. The centre’s astute kick took play to within five yards of the visitors’ line but Crocs conceded a penalty at the resulting line-out. Hullensians refused to give in and took advantage of Harding’s fifth successful penalty of the afternoon. This gave the visitors a lift and out of the blue they shunted the home pack off their own ball at a scrum and drove over the line. Harding’s conversion brought it back to within one score. Sensing a chance, despite being on the wrong end of a four to one try count, Hullensians broke clear and a clever kick to the corner was gathered by winger Josh Langford. His dive for the line was thwarted by a superb cover tackle from Jack Hammond. The ensuing line out saw the visitors attempt to catch and drive to the line but skipper Hamer ripped the ball clear and one last effort by Hullensians was dashed when Oxley stole a line out on the visitors’ throw.